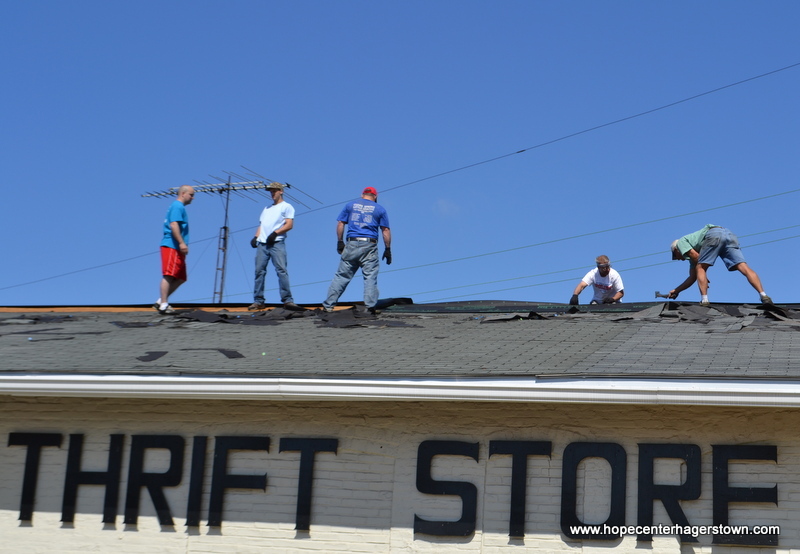 The roof on our Hagerstown Thrift Store was in desperate need of repair and replacement. 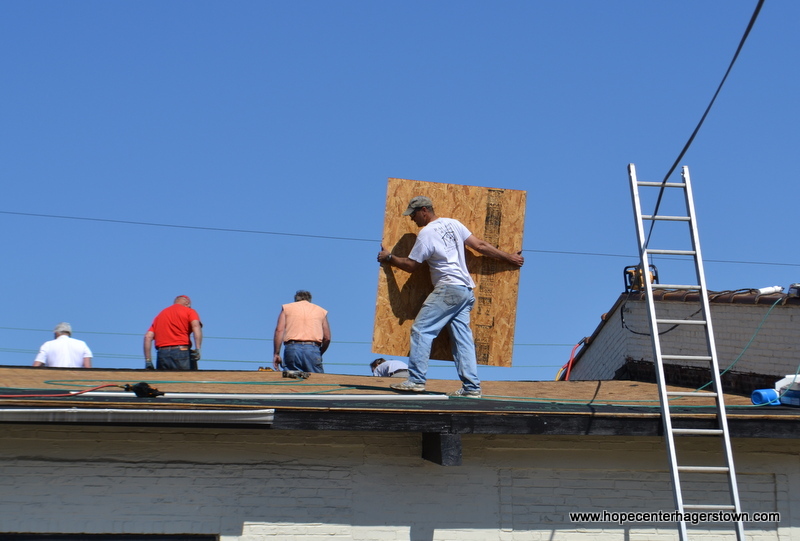 This would have been quite a costly investment but fortunately God provided some wonderful volunteers to help fix our roof and cut the costs of this project! 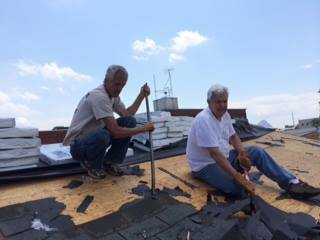 We’re so thankful for the 40 volunteers who worked hard for more than 30 hours tearing off the old roof and putting the new on. The volunteers were organized by Arnold Horst who was made aware of this need by our former store manager, AJ Imbach who went to Tri-state Fellowship with Arnold when AJ was employed with us. 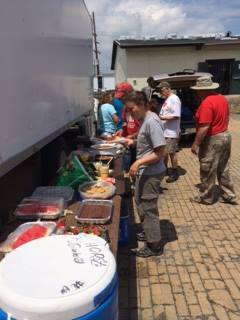 The majority of volunteers came from Tri-state Fellowship, including the wonderful volunteers who made sure there was plenty of food & drink for our roofers. 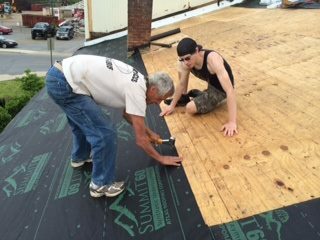 In addition to the folks from Tri-state Fellowship we had a former Hope Center resident and his parents volunteer, as well as two current residents in our Foundations Life Recovery program. 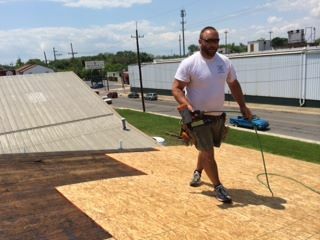 Our Hagerstown Thrift Store is a rather long building and replacing the roof was definitely not an easy task. These volunteers worked very efficiently and worked so well together that the project got finished quickly. We really appreciate Arnold Horst for having a heart for this ministry and for taking the time to help organize the volunteers to complete this project. Thanks to these great volunteers we were able to save money that can be used in other areas to help feed families, provide shelter for the homeless and give kids the opportunity to learn about Christ in a safe environment. 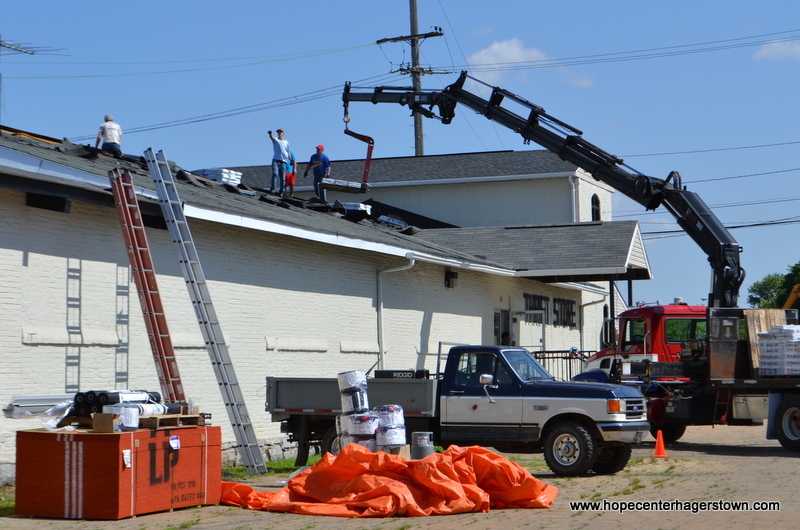 While it may just seem that these volunteers replaced a roof, but to someone in need they made a difference for eternity and only God knows the full impact of their volunteer service to The Hope Center. Volunteers, thank you so much for giving your time and energy to help improve the quality of our facilities! If you’re looking for a church to attend, why not check out Tri-State Fellowship? The church is located just outside of Hagerstown on the Cearfoss Pike. To learn more about service times, activities or anything else, please go to http://www.tristatefellowship.org. If you’d like to join the ranks of Hagerstown’s finest volunteers, contact us today. 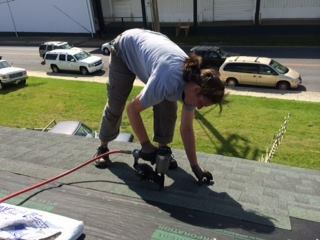 Even if construction is not your thing, we have plenty of other opportunities for you to volunteer. Want to learn more? Go to http://www.volunteerhagerstown.com and take a look at all the various opportunities that are available to you. If you’d like to talk to someone, call 301.739.1165. Sometimes it’s hard to venture out of your comfort zone. No matter where or no matter how, as humans we always have difficulty pushing ourselves to be challenged. And as Americans we enjoy the safety of our comfortable life. God has greatly blessed this nation and we are reaping the benefits of hard work and perseverance. But with the blessings comes the responsibility. As Christians, we are called to do more. We are told to step out of the comfort zone. We follow the example of Christ, who left the perfection of Heaven to come to the filth of earth. But it’s not always easy stepping out. And if we aren’t pushed, it almost never happens. But what if we all stepped out together? What if the Church followed the lead of Jesus and went where it’s uncomfortable? Lifehouse Church East is asking their people to do just that. But they aren’t just asking the people filling the seats to go. They sent 7 interns from the church into the community to witness and experience what can happen when you step out of your comfort zone and serve the Lord. And that’s when you realize that it’s not about me. Seven interns were sent into the community from Lifehouse Church East to serve the Lord in places that they’ve never been before. The Hope Center at Hagerstown Rescue Mission was fortunate enough to have 3 of these wonderful interns serve in our kitchen. These 3 interns helped our Food Services Manager, Aleta, in various ways in the kitchen. From helping to cook, to cleaning and serving, these interns were able to help feed hungry people in the community and interact with some of the residents in our Foundations program. One of the interns, Sheliea, said, “I had the most amazing, humble, inspiring experience volunteering at the Hope Center. I will be back and I would love to volunteer in the kitchen again.” Sheliea, Michael and Kassidy were able to serve lunch to the residents of The Hope Center as well as serving our afternoon meal to area guests in need of warm food. We’ve had a steady increase of people coming to our Soup Line this summer so it was nice for these interns to see the actual need in Hagerstown. When you take the leap outside of your comfort zone to minister to others you realize that maybe you are the one that is being ministered to the most! The fear and trepidation that we each feel at the initial step outside of our comfort zone is immediately replaced by the overwhelming peace and joy of serving God and knowing that this is where His heart is. When you step out to serve others, the Holy Spirit gives you such a feeling of happiness that no drug on earth could ever replicate. We are thankful for the interns from Lifehouse Church East who came to serve in the kitchen at The Hope Center. We welcome them back anytime with open arms! If you would like to experience the joy of serving Christ outside of your comfort zone then please don’t hesitate to get in contact with us! Call us at 301.739.1165 or email us at hagerstownrescue@verizon.net. If you would like to see and hear more of the testimonies from these interns, please visit Lifehouse Church East. The series, “It’s Not About Me” will begin on September 16th. Check out www.lifehousechurch.org to find service times and locations.